Speak to any investor, mentor or seasoned analyst, startups are integral in developing the technology industry and driving innovation. Having recovered from the dot-com crash, investment firms are consistently pumping money in technology startups in the hope that they will become the next Google or Facebook. Seed accelerators all over the world are taking the very latest startups, providing them with investment and mentoring to equip them with the tools they need to make their ideas a reality and their companies a success. Capturing the essence of a seed accelerator whilst refraining from investing in companies it works with, Microsoft’s own BizSpark startup program is helping to support the next Facebook’s or Google’s as they strive to make their way in a wickedly competitive market. Interested to see why Microsoft dedicates a considerable amount of resources into nurturing startup talent, I spoke to Mark Voermans, Strategic and Emerging Business Manager at Microsoft to see just how one of the world’s most recognisable brands has helped or is helping startups like Seesmic, Evernote and Yammer thrive. The premise of Microsoft’s BizSpark program is to ensure software startups succeed by providing them with tools and services that enable companies working with them to develop their ideas and adapt their products to work with the latest technologies. The company also helps to connect startups with key figures within the industry, helping to drive external investment, increase visibility and lay solid foundations for teams that have just started a business. Much like Microsoft, BizSpark operates and interacts with startups all over the world. Voermans, working in The Netherlands, underpins Microsoft’s BizSpark operations in the country, seeking out independent software vendors to work with and bring innovative solutions to market. Software startups may have moved away from Microsoft software but the chances are that they will operate using a small number of tools whether it be from the company’s huge software suites, operating systems or programming interfaces. At a time when money might be tight, Microsoft makes a point to offer all of its BizSpark entrepreneurs access to all of its software for free during over a three year period, also providing 750 hours of its cloud hosting platform Azure completely free of charge. Voermans tells me that Microsoft simply looks for potential, investing time and resources into the companies that are looking to do more with their products or services. Startups don’t need to be Microsoft evangelists to apply, a loose link to Microsoft via a Windows Phone 7 application or Outlook Add-in would be enough gain the company’s support. A lot of what we do is to advise startups and help them make connections. Once these connections have been made, we are able to help suggest tools and products with which they can build. We like to ensure companies work with at least one Microsoft product or service but many regional BizSpark programs will accept startups that want to join the program because they have the intention of using Microsoft software in the future, allowing the team to suggest tools and services that could expand a company’s operations. 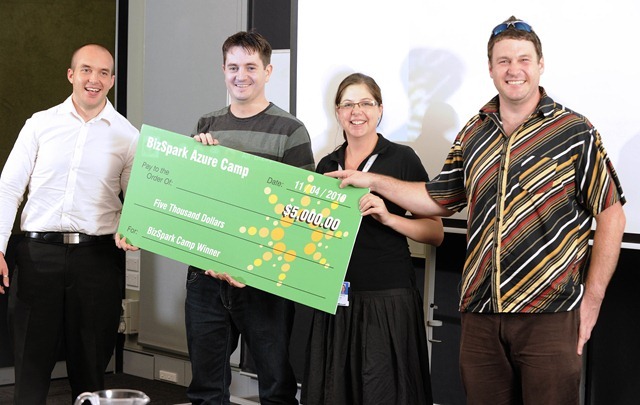 To apply for BizSpark, startups need to adhere to a small set of conditions. Access is limited to companies with a turnover under $1 million and doesn’t allow them to apply if they offer hosting, Website development, system integration, IT support services or outsourced development. Startups participate in the program for three years, though Voermans says that Microsoft requires companies to renew their membership yearly to ensure they are still viable entities and are still looking to push forward the development of their business. If a company decides to go public, it is no longer able to take advantage of the Bizspark program. When Bizspark first started accepting applications in almost a decade ago, applications came from startups that already had close ties with Microsoft. With no real marketing around he program, Voermans tells me that the company received 500 applications in The Netherlands alone last year, speaking to 290 startups individually to assess the needs and eligibility of their companies. So far, Bizspark has helped or is helping 600 startups in The Netherlands and around 40,000 worldwide. Spearheading recruitment in The Netherlands, Voermans speaks of his desire to boost the number of Dutch startups with great ideas to make the jump, aiming to double the number of applications in the next financial year. If a company shows a lot of potential and the ability to achieve high growth, Microsoft will nominate a small number of startups from its Bizspark program to join Bizspark One, a program that brings together the top 100 high potential and high growth startups to accelerate their development further. Microsoft provides virtual access to advisors and key members within Microsoft, which then assist with product development, provide technical resources and support systems. Well-known Internet companies Seesmic, Evernote and Yammer are part of Microsoft’s Bizspark One program. Noted for their strong potential to succeed, their ability to help shape the industry’s future and ability to enhance the overall value of Microsoft products, these companies work closely with Microsoft’s Bizspark teams, obtaining customized engagement plans to accelerate their growth. To assist companies like Yammer or Seesmic, Microsoft makes sure to notify these companies on its product roadmaps, providing exclusive access to its future plans so that they are able to adapt or introduce new features to their services ahead of time, without waiting for new feature sets to be announced. This is just part of a customized plan that is drawn up for each Bizspark startup, which assesses what the company thinks it needs and what advisors think the company will need in the three years it is part of the program. Each company will then be asked to sign Non Disclosure Agreements, ensuring sensitive information stays within the company but allows a small number of startups to work with the very latest technologies, before their competitors. Microsoft’s Bizspark program has a long line of distinguished alumni; some making waves in the online collaboration space, others getting acquired by Hollywood studios or trying to shakeup the way consumers listen to music on the web. It’s not widely known that social movie recommendation website Flixster once took its place amongst other startups on Microsoft’s Bizspark program before its acquisition by Warner Bros. Home Entertainment Group at the beginning of May. When the company first joined the program, Windows Phone 7 devices weren’t even on the market but with the company building applications on many platforms, including the web, iPhone, Android and BlackBerry, it shifted its focus to developing for Microsoft’s new mobile operating system as a result of its involvement with Bizspark. The Bizspark program has been very beneficial to Yammer. Through the program, we’ve received guidance on which products we should integrate with, what features we should leverage, and what technologies we should use to execute development. As a result, Yammer rolled out a successful integration with SharePoint, adding a social layer to the application. The reach of Microsoft’s program was demonstrated in The Telegraph’s Startup 100 competition. Of the one hundred companies listed, 18 of them were Bizspark companies, including Appsfire, Screenreach, Songkic, UberVU and Viadeo. Further to that, 6 startups (including Exceedra, Huddle and Kobojo) from the 18 are currently operating under the Microsoft’s Bizspark One guidance. Microsoft has invested a significant amount of money into advertising its Bizspark program, particularly via sponsorship deals with numerous technology conferences (including our own). The plan seems to be working, with applications rising significantly every year. The success of Microsoft’s iniative lies in the fact it doesn’t take away from the work that other accelerators are doing. Startups are able to apply for a place on the Bizspark program but also pursue other initiatives which help push their businesses in the right direction, without taking a cut of the startup’s profit in the process. For Microsoft, it’s a chance to be evangelical about its products and services. Startups receive the very best support, a chance to develop using new technology and possibly meeting the right connection to put them on the road to success. Read next: What should Apple buy with its billions? A carrier.